WASHINGTON — Attorney General Eric Holder and other officials are condemning the fatal shooting of two New York police officers inside their patrol car. 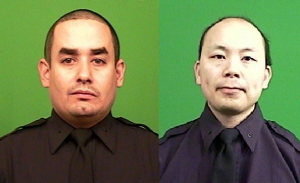 Rafael Ramos and Wenjian Liu were ambushed on Saturday in the Bedford-Stuyvesant section of Brooklyn. The gunman, Ismaaiyl Brinsley, who had vowed online to shoot two “pigs” in retaliation for the police chokehold death of Eric Garner, was pursued by police to a nearby subway station, where he shot himself in the head. Liu, who was a teenager when he immigrated with his family from Taishan in China’s Guangdong Province, attended Kingsborough Community College and College of Staten Island, and worked as an auxiliary officer before joining the NYPD seven years ago. He moved this year to Brooklyn’s Gravesend section. Police Sgt. James Ng served as translator for Liu’s parents at Brooklyn’s Woodhull Hospital, where their son was taken after the shooting. “His parents are understandably grief-stricken over the loss of their only child,” said Ng, who is president of the National Asian Peace Officers Association. According to Ng, Liu was a valuable asset to the NYPD because he was conversant in several Chinese dialects and helped the department with community relations in heavily Chinese neighborhoods. Mayor Bill de Blasio said authorities were working on arrangements for members of the Liu family to come from China for the funeral. “I condemn this afternoon’s senseless shooting of two New York City police officers in the strongest possible terms,” Holder said in a statement. “This was an unspeakable act of barbarism, and I was deeply saddened to hear of the loss of these two brave officers in the line of duty. “On behalf of all those who serve in the United States Department of Justice, I want to express my heartfelt condolences to the officers’ loved ones and colleagues. I will make available all of the resources of the department to aid the NYPD in investigating this tragedy. 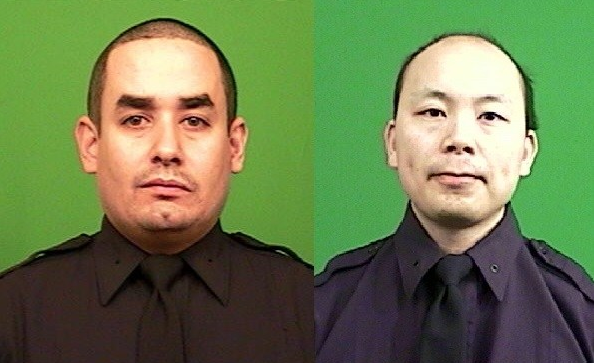 Rep. Grace Meng (D-N.Y.), who represents Queens, commented, “There are no words to describe the cowardly and barbaric murders of two NYPD officers tonight. These types of violent acts are un-American, and I ask all New Yorkers to join me in condemning these horrific crimes in the strongest possible terms. I thank the NYPD for their bravery and commitment to protecting our city, and I stand with the department during this very difficult time.